The same Google Street View tab is now available on your Activity, Route and Segment Details pages. Top Tip: Holding the control/ctrl key down while moving the mouse over the top elevation profile (Activity & Route Details) jumps the Street View man straight to that point. View this Fred Whitton activity on VeloViewer. 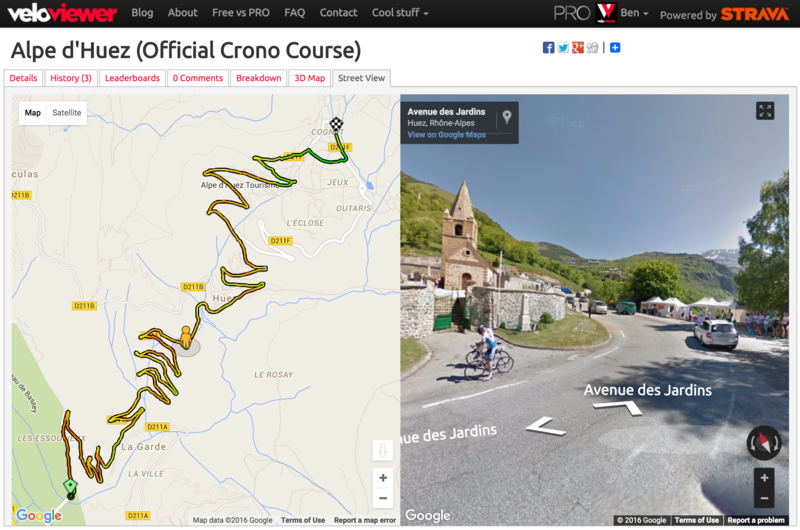 View this Alp d’Huez segment on VeloViewer. Start and end markers will be shown in the Street View images. Note: Colour gradients also shown when embedding segments with map on your blog. NOTE: I’m running a trial on the Route Details page to only use Google Maps so the Street View is now available on the main map tab and the specific “Street View” tab has been removed. Note: If no Street View images are available for a position you will see a blank pane on the right hand side. Street view doesn’t work for me. Tried on chrome and IOS and clicked your links above. Just get the map line but blank background and no street view. But you don’t see if email address will be displayed (I presume not!) and it seems to require a website to be entered in order to leave a comment, which is surely a bug?